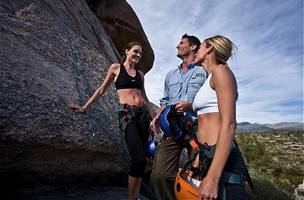 Sawyer Adventures is the official guide service for Rock Climbing, Mountain Biking, and Hiking at The Boulders Resort in Carefree, Arizona. Often named as the best resort in North America, The Boulders is the proud recipient of the AAA Five Diamond Award for 19 consecutive years. Sawyer Adventures and its guides are honored to have been a part of that success, since 1999. We offer a variety of outdoor adventures, and we can accommodate a wide range of fitness and skill levels -- from the novice, to the weekend warrior, to the seasoned mountaineer.